A few months back, a discussion broke out during lunch at work on altruism. Some of my colleagues insisted that humans are inherently selfish and people who engage in altruism are actually doing it not out of some genuine desire to help people who are needy but to make them feel good about themselves. I felt that might be the norm but there are still some people in the world who help out of a genuine desire to benefit those who need it. When it comes to human behaviour, I believe it is too complex to classify easily, especially by using generalisations. I have seen a lot of people, especially those who donate to religious causes who insist that their name be displayed prominently among the list of donors because they have donated a larger amount. Some would even decide the amount of money being donated based on how visible the news of the donation is going to be. Sadly, my religion, Jainism has also become prey to this culture of vulgar displays of generosity. 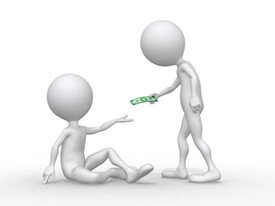 It is more important to many people to be seen doing charity rather than actually being charitable. The sangh and the clergy encourage this as well. It serves their purpose well. Another fashionable trend that has started is for people to donate in their late parents' memory. The parents' name is displayed rather than their own. It's almost as if people wouldn't get to know who has actually spent the money. No right thinking individual can condone this kind of conditional charity. It would be interesting to see how things change if for just one year, a decision is taken that all donations would be anonymous. However, the topic at hand is the more subtle kind of altruism where people don't get the publicity that I have talked about above. They may donate anonymously. My colleagues argue that even this is with a selfish intent of 'feeling good about themselves'. Even if this is true, I wouldn't mind this kind of 'feeling good'. At the end of the day people can feel good about themselves in whichever way they want to. Some people feel good by spending on themselves, while others may feel good by spending on the needy. At least in the latter, someone who really needed the money or the resources (arguably more than you did) has benefitted. The point I'm trying to make is that first kind of people (who spend the money on themselves) are more selfish than the second kind (those who spend the money on the needy). And all this is assuming that those who donate are doing it only because they feel good about themselves. As I said before, human emotions are too complex to categorize in this manner and it is difficult to say with any certainty how they play out in the end. Great points Kamal and agree with you. !